How do I enable Open Enrollment for my live training? 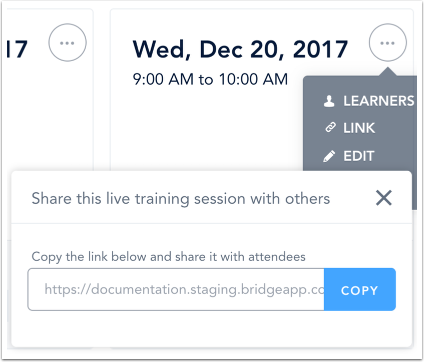 Registration links allow Bridge users to provide quick registration access to online and live trainings outside of Bridge. 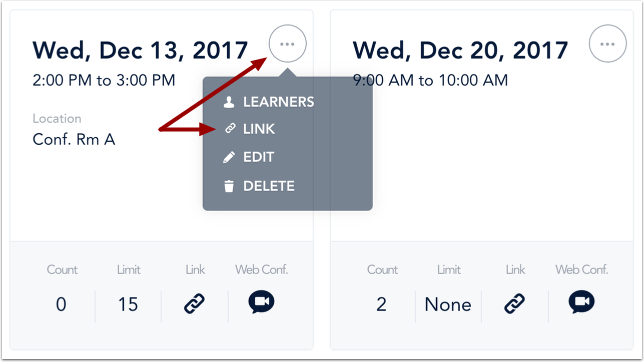 Once a live training has been created, you can enable Open Enrollment and share the link with learners. Learners will then be able to use the link to register for live training sessions. Registration links can be created for a live training or a specific live training session via the live training details page once the Open Enrollment option has been enabled. In the Author menu, click the Live Trainings link. On the Live Trainings page, click the name of the live training. On the live training details page, click the Sharable Link icon. Click the Sharable Link toggle button. Click the Copy button to copy the link to your clipboard. You can share this link anywhere inside or outside of Bridge. Learners will be directed to the registration page to choose the session they would like to register for. If you would like to send a sharable link for a specific session, click the Session Options icon. From the menu that appears, click the Link button. Click the Copy button to copy the link to your clipboard. You can share this link anywhere inside or outside of Bridge. Learners will be directed to the registration page to either accept or reject the session registration. Previous Topic:How do I set an expiration and re-enrollment date for a live training? Next Topic:How do I find a learner to add to a live training? Table of Contents > Manage Live Trainings > How do I enable Open Enrollment for my live training? How do I find a learner to add to a live training? How do I set an expiration and re-enrollment date for a live training?